This is the advance reading copy of The Dark Wind. The fifth book in Tony Hillerman's Navajo Mystery Series, The Dark Wind is the second novel featuring the protagonist Sergeant Jim Chee of the Navajo Tribal Police.
" Reviewers are reminded that changes may be made in this proof copy before books are printed. If any material from the book is quoted in a review, the quotation should be checked against the final bound book." 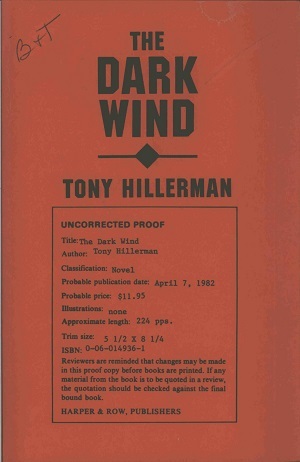 [i-ii] Brief Description, [iii] half title THE DARK WIND, [iv] BOOKS BY TONY HILLERMAN, [v] title, [vi] copyright FIRST EDITION...82 83 84 85 86 10 9 8 7 6 5 4 3 2 1, [vii] dedication, [viii] blank, [ix] AUTHOR'S NOTES, [x] blank, [xi] fly title THE DARK WIND, [xii] blank, 1-214 text, [215-220] blank. Format: Paperback, 21.2 x 13.6 cm. Binding: Strong Red paper covers with publishing information printed in black on the front and the title printed vertically in black on the spine.